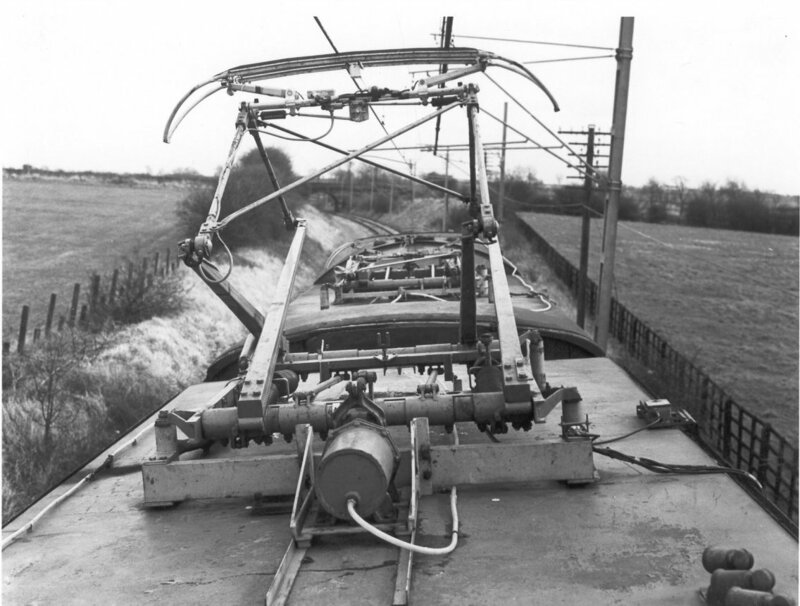 The High Speed Current Collection Project trials, from which the now widely-used BR/Brecknell, Willis High Speed pantograph was developed, were conducted at the test track between 1973 and 1982. The principle of the trials was to validate, by experiment, the predictions of a computer program, which modelled the overhead and pantograph as a complete system of masses, springs, struts and ties etc. 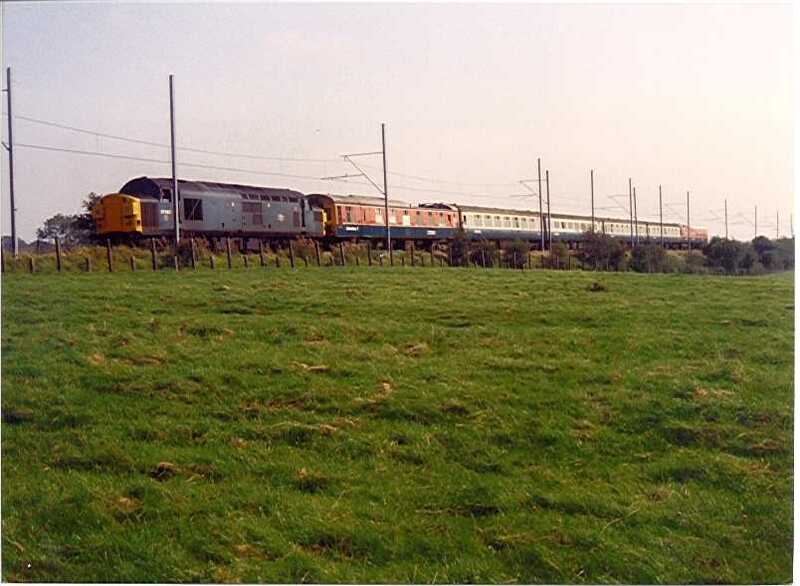 The overhead line at Old Dalby was originally constructed in 1973 with five tension lengths, two of which were devoted to 'scaled' equipment, having half the normal mast spacing and twice the usual contact wire mass. The contact and catenary wires consisted, in fact, of wire rope approx. 20mm diameter. The dynamics were such that running over this equipment represented normal running at twice the train's speed over conventional equipment. The remainder of the system replicated the equipment in use on BR at the time i.e. Mk3B with a complete neutral section installed at Widmerpool. This was used for high speed, close-up filming of various types of pantographs at speed, in order to determine the pantograph's behaviour whilst traversing the NS, which was effectively a 'hard spot' on the system. 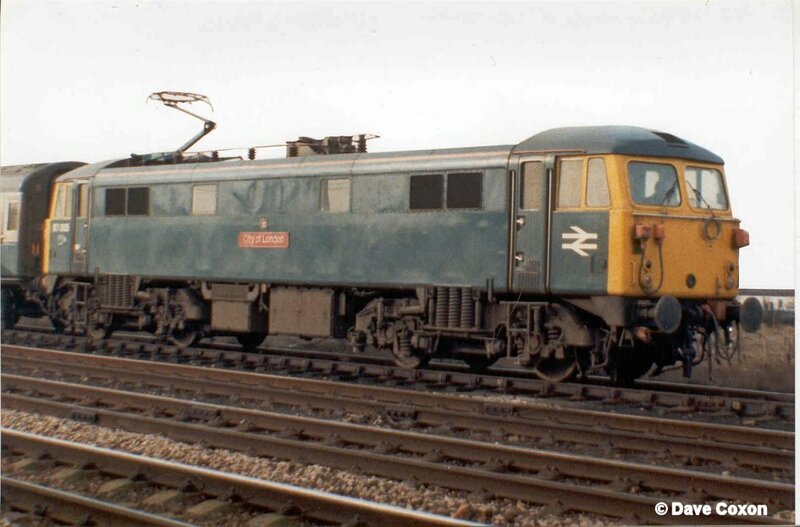 Various designs of NS were also trialled in this way. 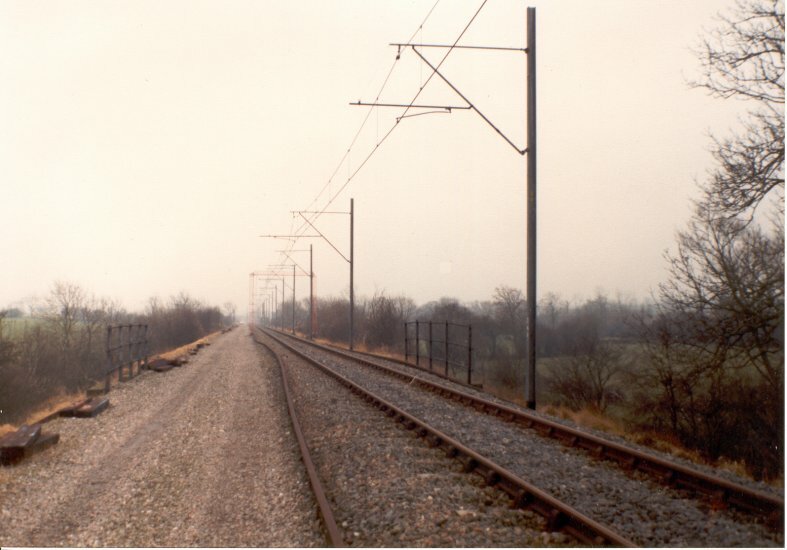 Although the OHLE was erected primarily for the Electrification Section of the R&DD for trials with a servo-assisted pantograph and development of high speed neutral sections, section insulators etc, by the late 1970's the Dynamics Section were casting glances towards this facility. 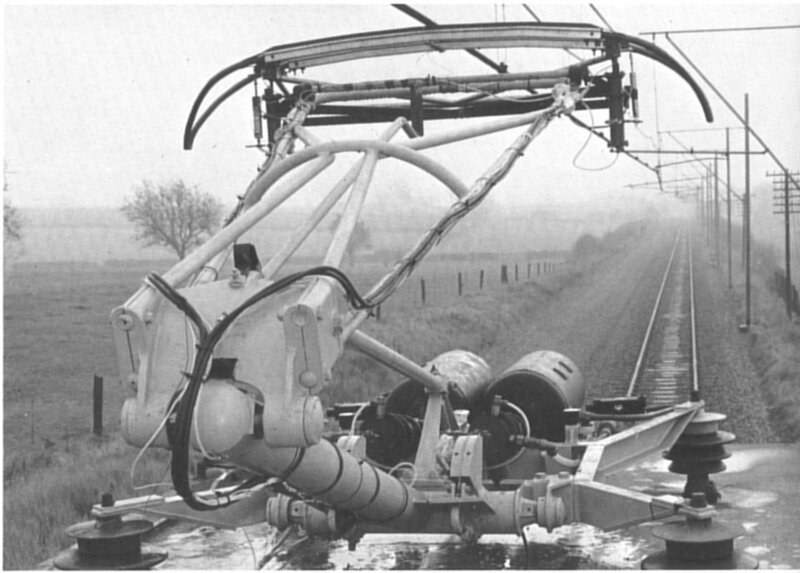 The potential offered by the BR/Brecknell Willis pantograph in the furtherance of studies into modelling the interaction between pantograph and OHLE meant that the Electrification boys took second place at the test track. 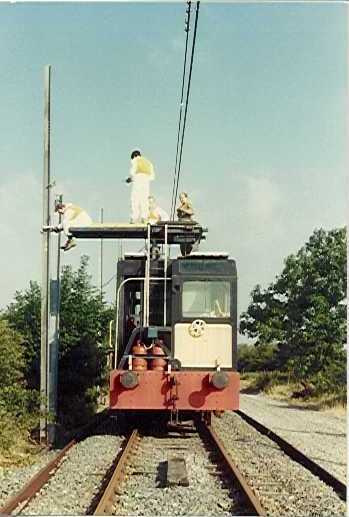 Static and dynamic tests were carried out over a number of years at the test track, during which time various experimental pantographs were constructed, modified and discarded. As with all projects there was a great deal of preliminary work carried out before the final developments. This project commenced by utilising the existing pantographs which were in use on BR at the time. Examples of both the Faiveley AMBR and the AEI Cross Arm pantographs were acquired and subsequently modified with an additional top frame etc. but found eventually to be unsuitable. 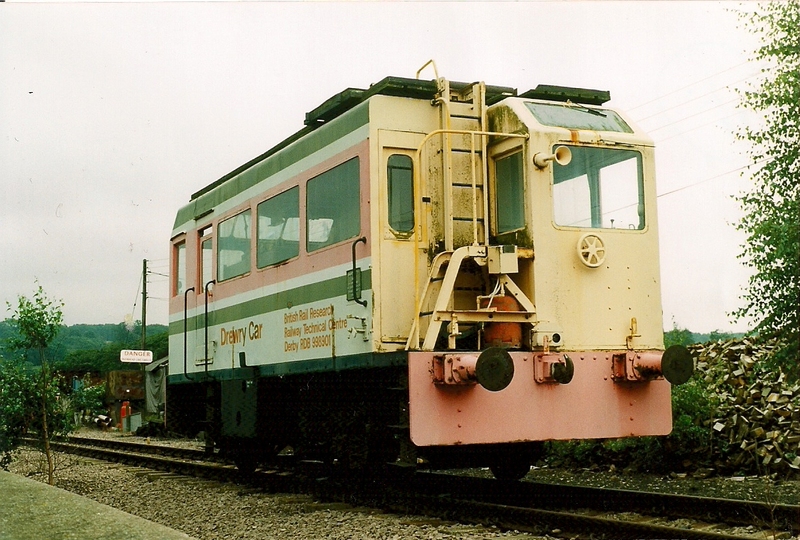 However with the assistance of Brecknell, Willis and Company the final pantograph, which was developed as a result, proved to be a world-beater and can be seen in places as diverse as the USA, Taipei and Bletchley Depot. A potted history of its development and its ups and downs is included on the Brecknell Willis highspeed pantograph page on my train testing web site. A variation is now fitted to the Pendolino. Here are some pictures of the various works undertaken on this Project - click on the picture for a bigger image. Lab Coach 1 RDB975000 (right) stands near the overbridge on the A46 in the company of High Speed Freight Vehicle 1 (HSFV1) RDB511023 and High Speed Freight Vehicle 4 (HSFV4 - a Ferry Van) RDB 787319, parked some distance away, during static vibration tests on the overhead line in the mid 1970's. A closer view of the test. 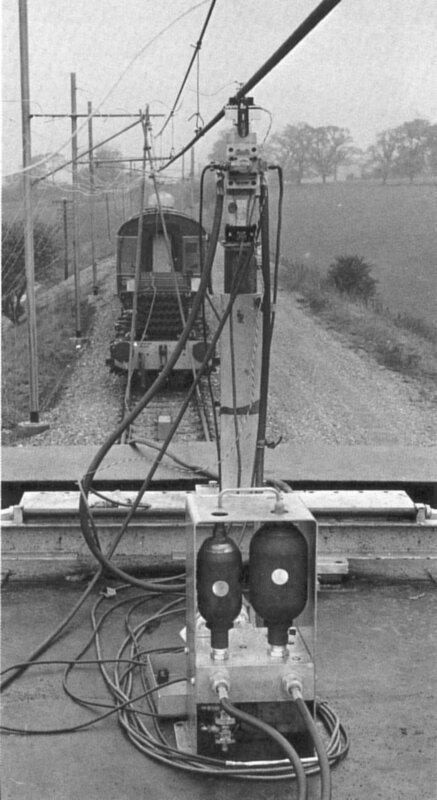 Various instruments were fitted to the overhead line during this type of test to monitor the movements. A hydraulic ram was connected to the OHLE for the tests and a series of vibration tests were undertaken. The tripod of scaffold poles is there to anchor the catenary and contact wire for the trial. 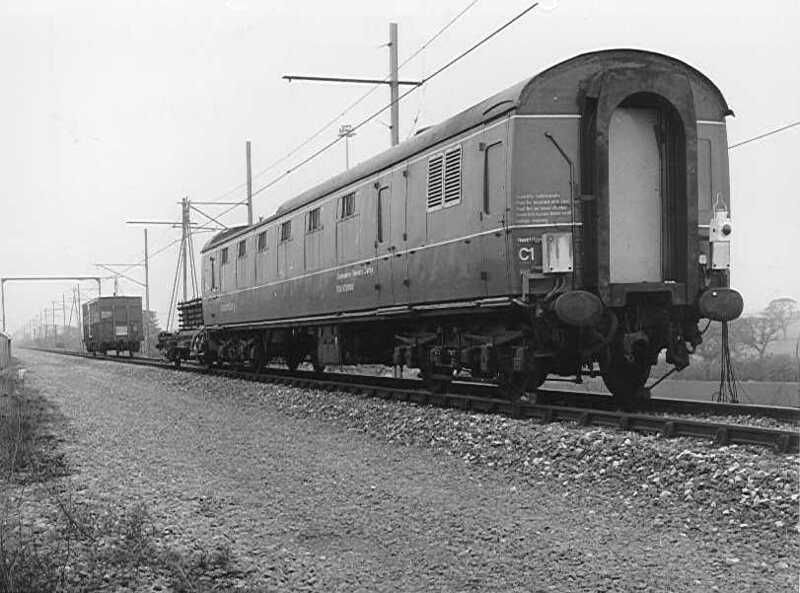 Note that the coach has its original BR1 bogies - later it was fitted with APT-E LC1 bogies for high speed running. Another view shows the hydraulic ram mounted on the roof of the ferry van. Due to the effects of sunlight spoiling the tests, as it caused the wire to expand, further work was conducted at night when the temperature was more stable. A dramatic shot of HSFV4 shows the hydraulic ram on the track and the instrument cables hanging from the OHLE. This was taken in the vicinity of 114 MP at the top of the Widmerpool straight. Lab 1 can be seen in the background. Here is a classic picture taken from the roof of the ex-LMS pantograph test vehicle (Lab 26) as the train rounds Folly Hall curve and heads down the Widmerpool straight in 1973 not long after the equipment had been installed. The AEI Cross Arm pantograph has been heavily modified with an extra top arm and carries various items of instrumentation. The second vehicle also carries another AEI Cross Arm pan, possibly a servo-assisted derivative. Here's the precursor of the work which was to result in a world-beating pantograph. A Stone-Faiveley AMBR (bicycle frame) pantograph is pictured on the test car similarly modified with an extra top frame and one piece carbons. It was also fitted with twin air cylinder suspension in place of the usual springs. 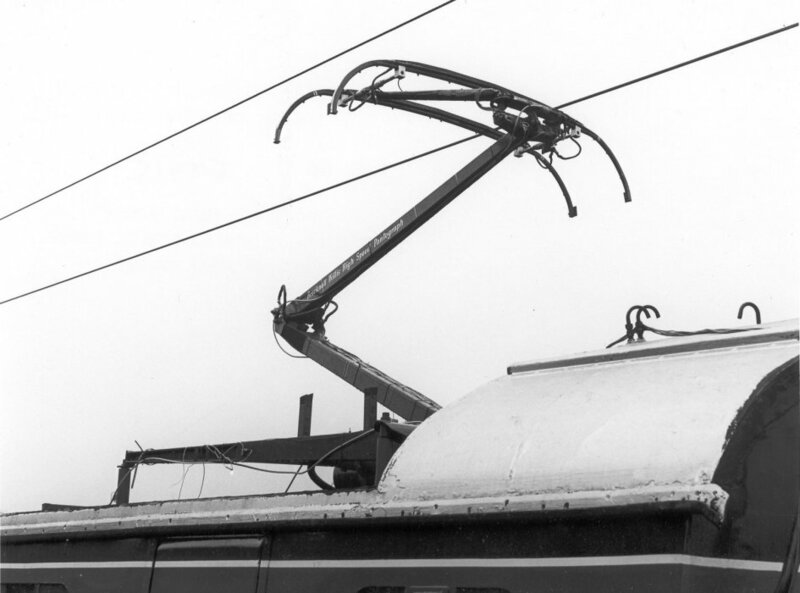 The early version of the BR/Brecknell, Willis Highspeed pantograph pictured on the roof of Lab One in 1977. 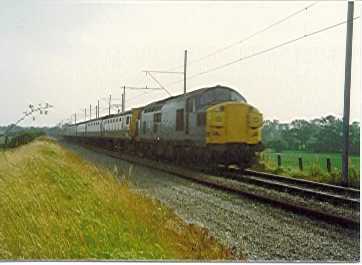 A six coach pantograph test train headed by Class 37 No: 37067 heads north down the gradient past 114MP. 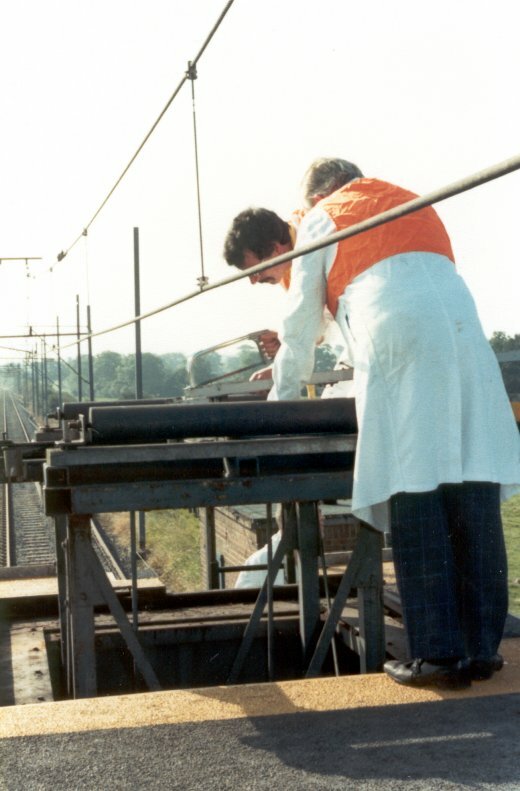 These tests in 1982 were carried out to establish the performance of two pantographs running at various different spacings. Moments later the train is past and heading away towards Widmerpool, one and a quarter miles away. The P-Way hut on the left was often used as a base. It had a nice coal stove inside which was sometimes used during winter testing. The hut still stands today. 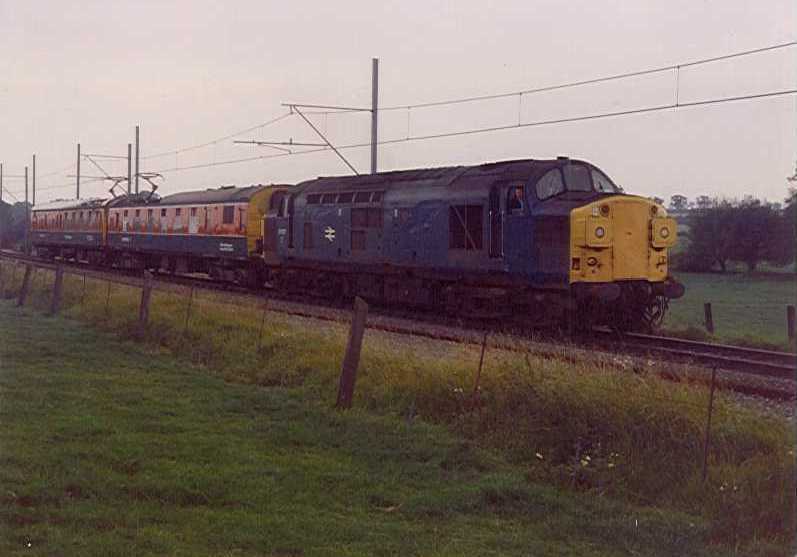 As part of the tests another variation of train formation sees the two Lab coaches marshalled adjacent to each other with the Class 37 on another trip down the straight. 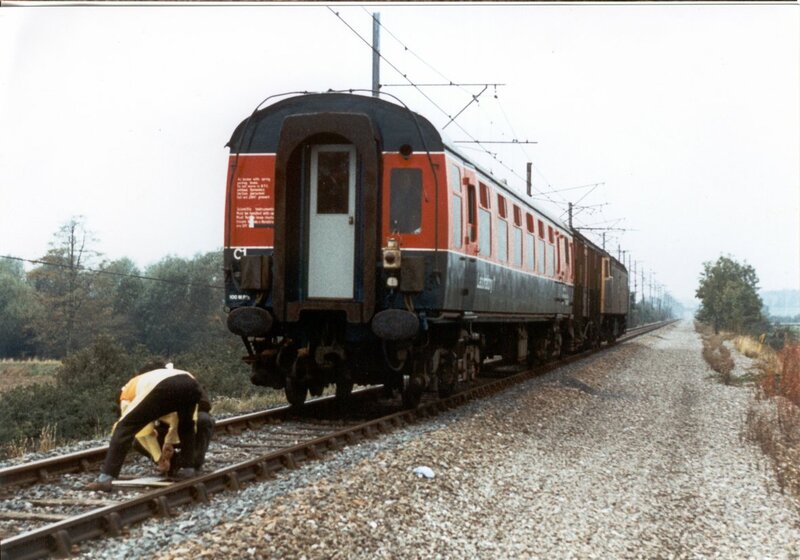 Quite what was happening on this occasion is forgotten now but this is the hut at MP114 where instrumentation was occasionally housed during pantograph testing. The view from the A46 road bridge looking south not long after the equipment had been installed. Note the instrumentation on the nearest mast. The view in the opposite direction towards the former Widmerpool station. The Schooner Inn (later the Pullman Inn) can be seen on the right through the bridge. 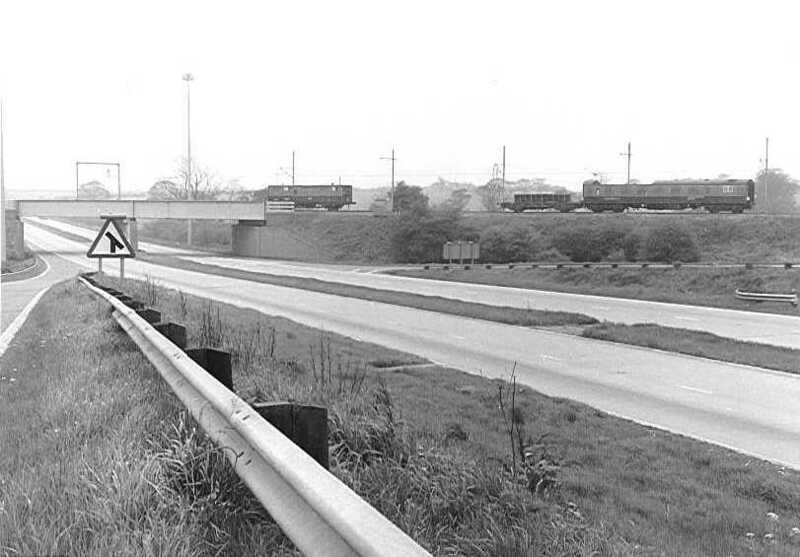 A 1981 view looking south towards Folly Hall curve on the Widmerpool straight showing the 'scaled' catenary. 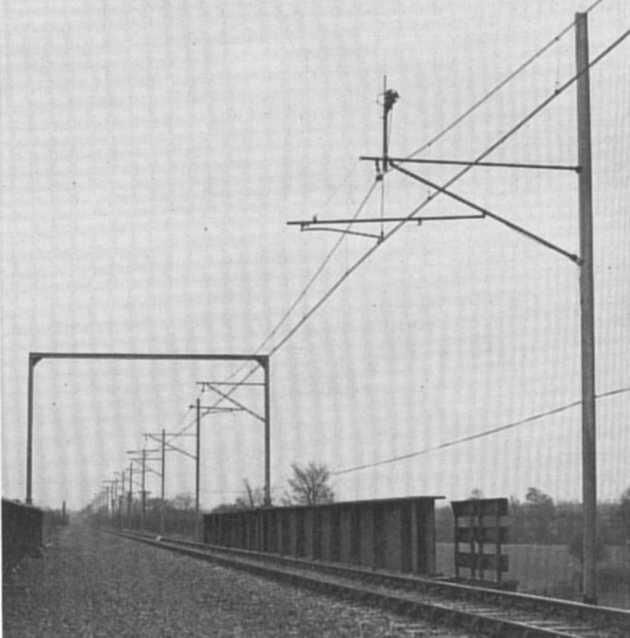 With the completion of the HSCC Project the overhead equipment part of the test track was used for aerodynamic testing as well as some development work by the Electrification Section with servo-assisted pantographs and high speed neutral sections. 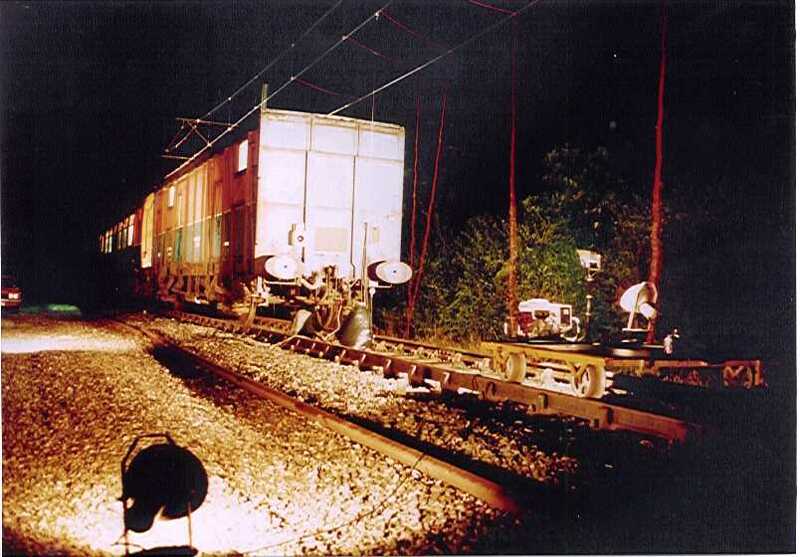 In connection with this a class 87 loco was utilised and rumour had it that the pantograph was not successfully lowered at the end of the test run resulting in it striking an over bridge. However I cannot vouch for this story! 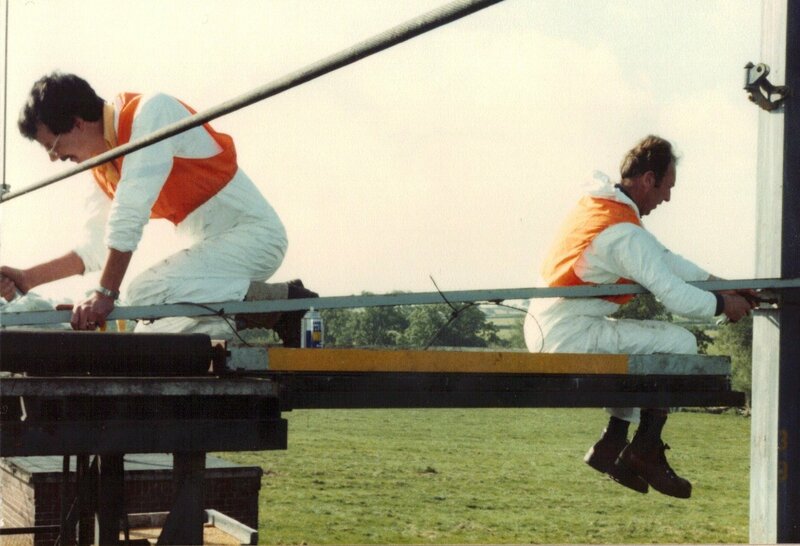 Over the latter years of the HSCCP test programme from 1978-83 the scaled overhead equipment was re-built several times to represent different types of equipment, i.e. 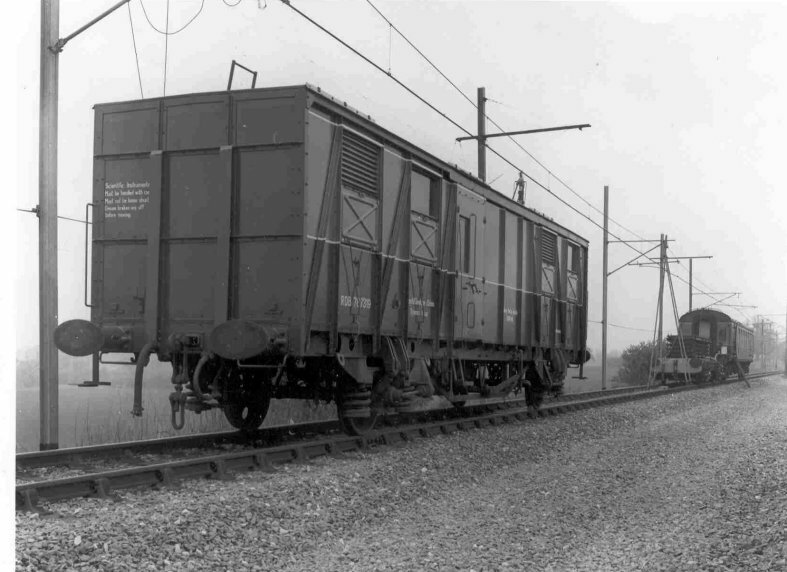 trolley wire (a single contact wire only), stitched equipment (as used extensively on the high speed lines in France) and Mk4 equipment (with higher tension in the cables). 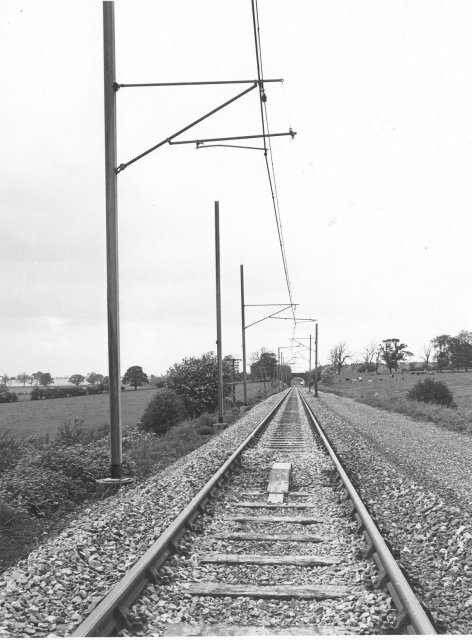 Representative bridge and level crossing wire gradients were also included in the 'scaled' equipment. 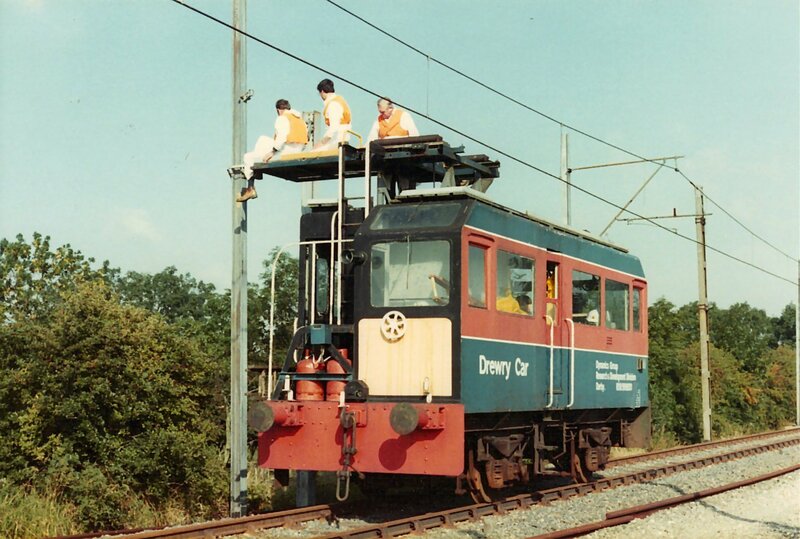 To accomplish this a Drewry Car self-propelled overhead line maintenance vehicle was acquired from the Eastern Region in 1977/78. 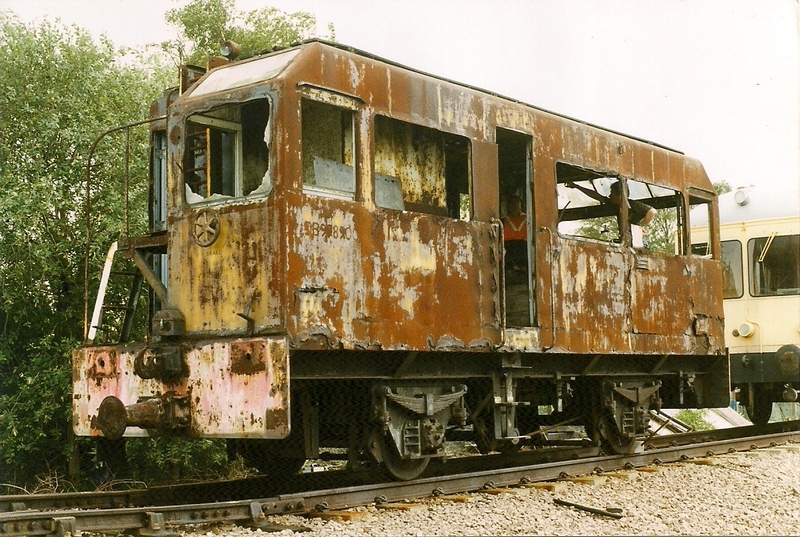 It had been one of a small class of vehicles used extensively on the former Manchester, Sheffield, Wath DC lines and also on the GE and was restored and modified in the workshop at the RTC for use at Old Dalby. 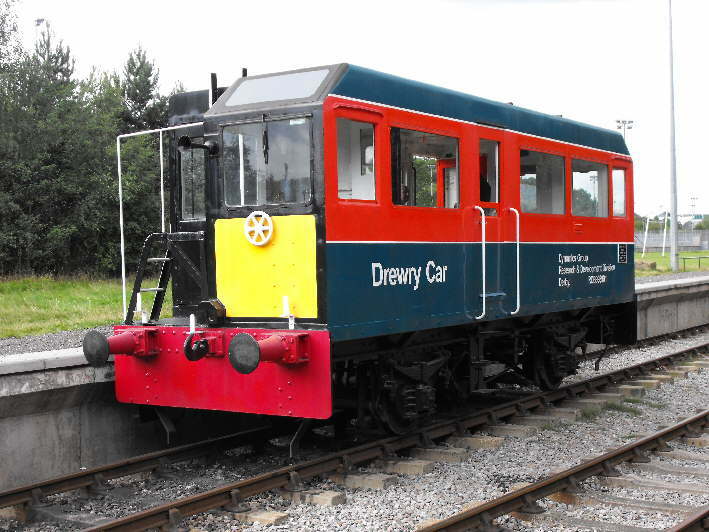 Two Drewry Cars were acquired by R & D - one was used as spares. Equipment consisted of an hydraulic access tower which could be raised and lowered as required. This was original equipment onto which was mounted a new solid timber platform which was capable of extending either side in order to access the fittings on the masts. Creature comforts included a small gas cooker mounted on one end of the workbench and a couple of gas heaters mounted on the wall sides within the vehicle. Opposite the workbench was a bench type seat. A wooden extending ladder was mounted on supports on the outside of the vehicle for independent access to masts and contact wire. I well remember climbing the ladder to fit accelerometers to the centre of the spans - very disconcerting when you're up in the air 16 feet off the ground with nothing surrounding the ladder! 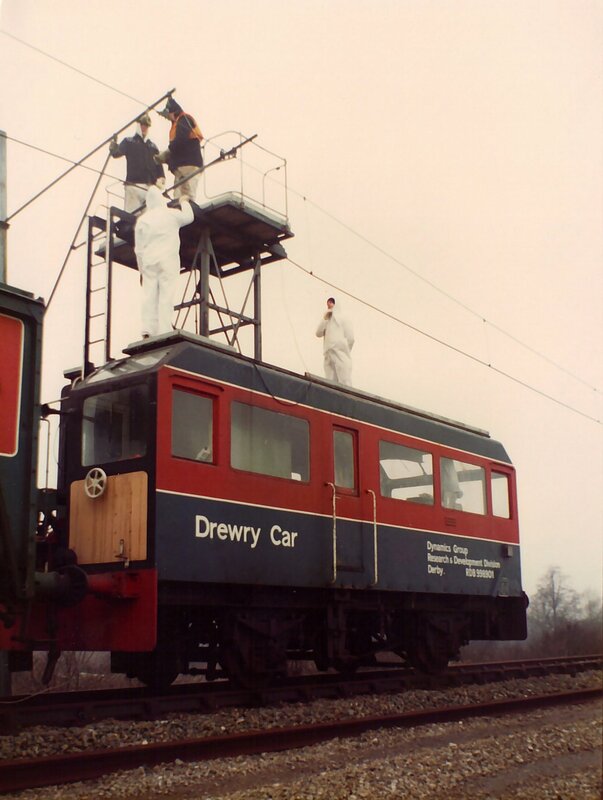 The Drewry Car OHLE Inspection vehicle RDB998901 is seen in action with engineers re-building a structure on the Widmerpool straight. This was the middle of February and the staff are well wrapped up against the cold. The hydraulic tower is shown raised and the platform extended providing access to the upper parts of the masts and the catenary fittings. Notice the detachable guard rails - useful but generally got in the way when work was being carried out. On the left can be seen the Ferry Van HSFV4. 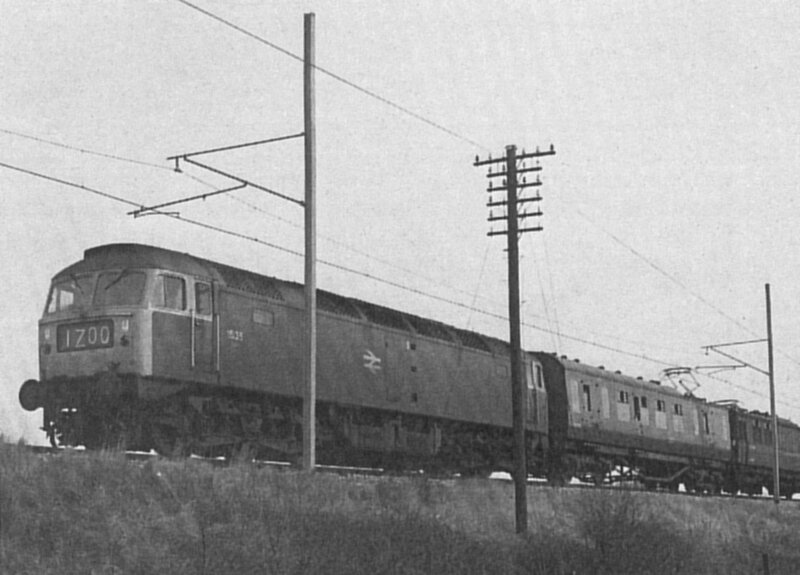 Another view showing the Drewry Car with HSFV4 in tow. It could manage a light load such as this. I well remember that the gas heaters in the Drewry Car caused running water inside on the single glazed windows on cold winter's days. On another visit to the test track - this time in the summer. 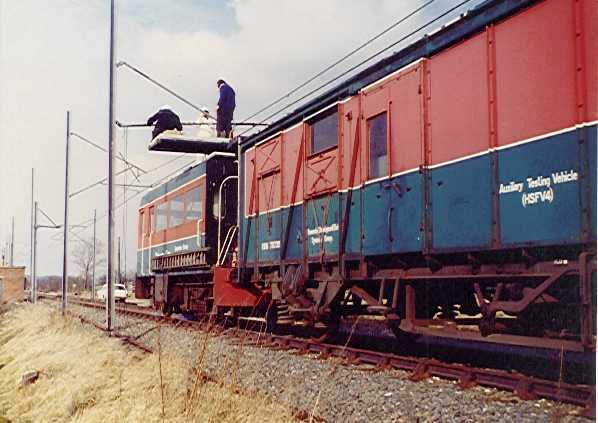 This view shows the Drewry Car in the vicinity of 114 MP with the working platform extended to the cess side. The hydraulic tower is retracted. A close up of the work - here some unidentified piece is being sawn by the author whilst a colleague assists - on a nice sunny summer's day. Hydraulic tower retracted and ready to return to the Control Centre. What a way to spend a nice summer's day! 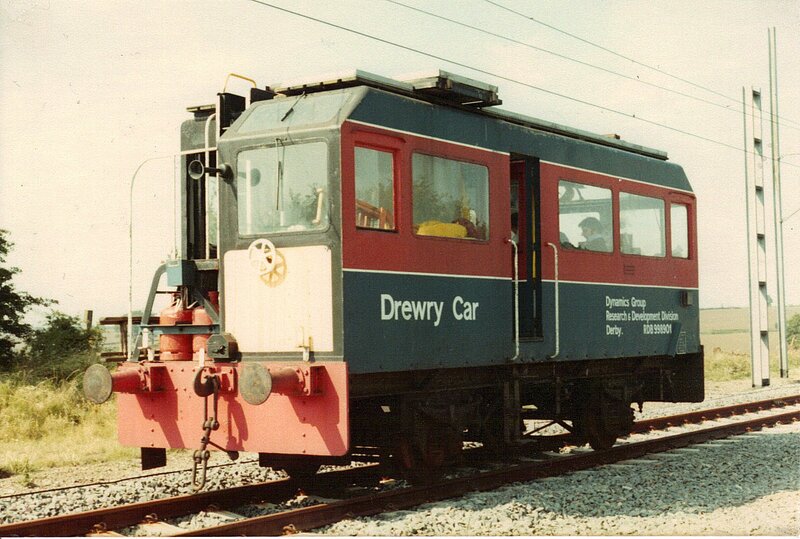 Although two Drewry Cars were acquired by R & D and numbered RDB998900 and RDB998901 only one was modified for its new role. It was utilised for a number of years, and was even painted in the new colours of red & beige. However together with its mate it was eventually sold off to the EM2 Society as no longer being required. 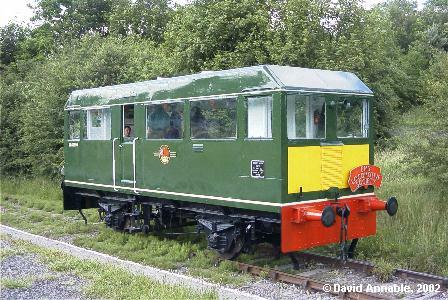 Today it has been restored to its Research Division livery and fitted with seating. 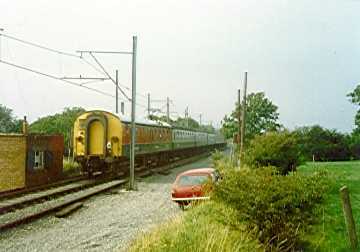 DB988901 in BR green as running on the Middleton Railway in 2000. 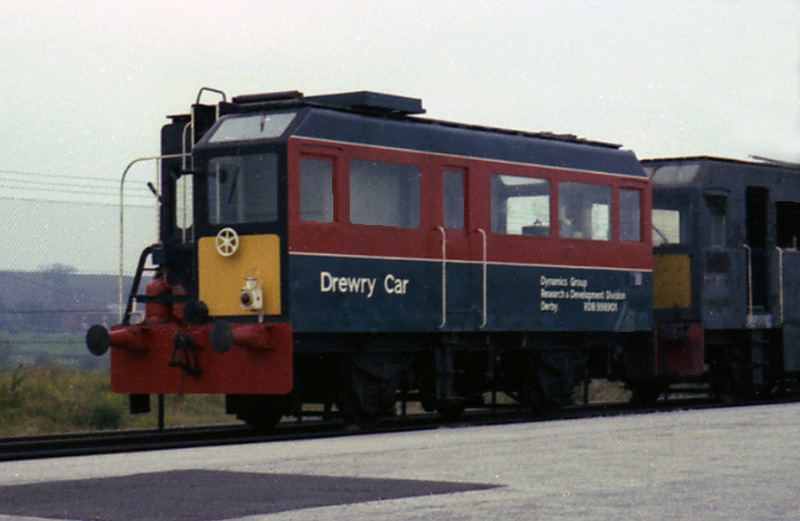 The Drewry car back in the red and blue of the R&DD.